Early season bass lure fishing is never easy – the fish are either there or they aren’t. Could they be preoccupied with the moulting crabs? Or are they harassing huge sandeel shoals further down the coast? Either way, it’s been slightly frustrating on the bass front lately – I’ve seen lots of fish follow, swirl and seemingly ‘let go’ of lures fished by a couple of recent clients and when I’ve been out during my solo sessions. My own thoughts are that it needs to warm up a bit. We need a period of westerly winds and the sandeels need to spread out along the coastline – I still haven’t seen any sandeels yet despite a diving friend of mine confirming they were about some weeks ago… Anyway, that’s my theories! Onto some fishing! 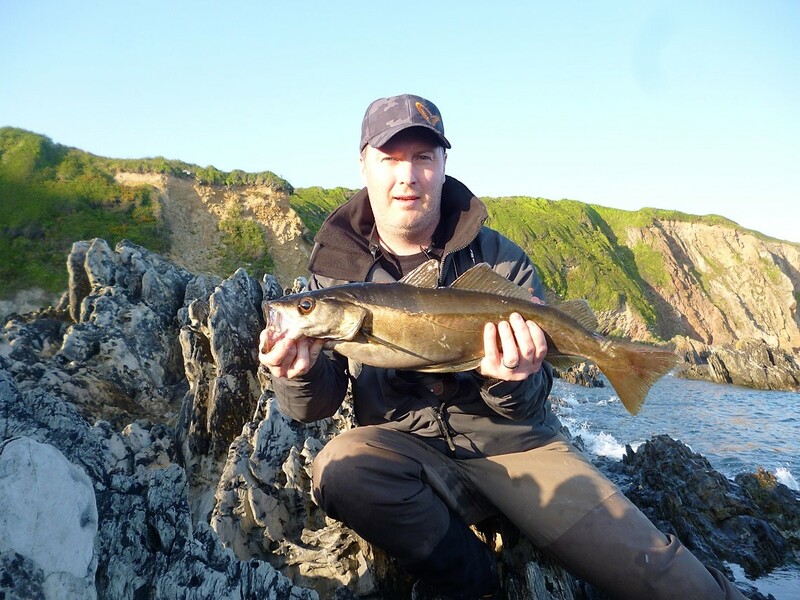 The weather has been glorious recently with clear seas and blue skies, but a nagging easterly wind completely flattening out the sea therefore, a change of tactics or rather a change of target species had to be introduced until the bass numbers increase. My first solo session was on a calm evening (with an occassional 2ft swell) from a beautiful and very shallow part of the south Devon coastline. My intention was to keep moving and try to cover as much ground as possible as the light faded. I was using an OSP DolIve Stick due to the water clarity (very clear) and requirement for natural presentation. In the two hours that I fished, I must have covered at least a mile across the rocks and reefs without a sniff – until a very positive hit during the final minutes of daylight resulted in this hungry wrasse (below). I was guiding a client for the next session. 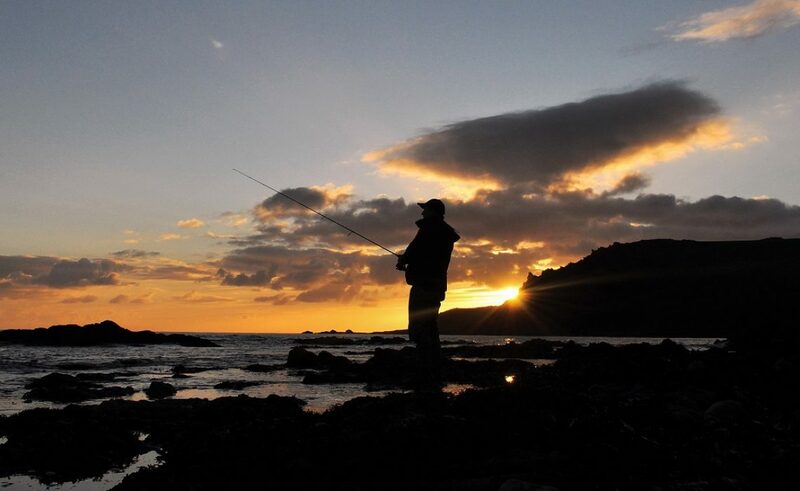 Tom is a regular visitor to south Devon and a successful lure angler in his own right. Essentially, he wanted to gain some local knowledge around a particular stretch of coastline that he loves, in order to maximise his chances for when he holidays here with his Family. Fully kitted out, his lure collection was pretty impressive but his favourite lure is, without doubt, the Fiiish Black Minnow! All lure types were utilised during the session – weedless soft plastics, surface lures, and minnows with varying swimming depths were cast and retrieved into a number of spots. On each mark, Tom asked the question “So, you wouldn’t throw a Fiiish Minnow in there then?” To which my reply on the vast majority of occasions was “Personally, I wouldn’t as there are others lures more suited to that spot unless you want to get snagged up on every cast and more than likely lose it”… Plus, it was bass we were after and I was acutely aware that wrasse love nothing more than to literally munch Fiiish minnows around this area! However, the final mark of the day was a cove where we could access a slither of rock and remain on it over the high tide period – the exact spot where a previous client this season nailed a beautiful bass in late March (see here). Although the sun was now very high and very strong, I was confident (due to the amount of movement from the waves) that we would see some kind of action. With the tide flooding strongly I encouraged Tom to rotate through the lure types until we found the magic formula. Shallow divers and surface lures belonging to Tom and I were deployed. Weedless soft plastics (DoLive Shad and the weedless version of the Savage Gear Sandeel) were also expertly worked by Tom in around the snaggy ground, that was now covered by around 6ft of water. I could tell that Tom was itching to get his beloved Fiiish Minnow onto the lure clip – a lure he has supreme confidence in. So on it went and sure enough, after five or six casts BANG! my net was called into action as a decent wrasse broke the surface – great stuff! (that showed me!) A couple of close shaves with the reef ensued (with lots of patience required to nudge the lure out of some snags) but the successful lure did account for a further wrasse of a similar size (but in a completely different colour scheme) before the session ended. Tom departed a happy client who’d got what he wanted out of the session and despite not actually landing a bass it was a very enjoyable day with lots of laughs and stories. A lesson learnt for me though – allow the client to use the lure they have the most confidence in more often! The swell, breaking waves, aerated sea and white water around the rocks just wasn’t quite enough to encourage any bass that might have been around to venture close to the area therefore, another plan was hatched… It was wrasse and pollack time! The mark in question is very very rarely fished I imagine. In fact, in the 25 years that I’ve fished it I have never seen anyone anywhere near it – my kind of mark! A few exploratory casts into and around a few gullies resulted in a small but spectacularly coloured wrasse with a very distinctive green tail (below) taken on the ever faithful and very consistent Illex Nitro Sprat. It’s a hell of a lot of fun catching wrasse on lures that’s for sure, and totally different to yanking them out of their weedy holes on crab baits and hauling them up the rock ledges on beach fishing gear – this truly is a very sporting way to target them if you’ve never tried it. Remote areas of coastline that aren’t regularly fished will often contain concentrations of decent sized pollack – as they are renowned for being quite territorial and will remain in the same areas all their lives; only moving out in to deeper water during the coldest months. Indeed, I have landed some decent (for the shore) pollack on lures around the 3 – 4lb mark on a number of occassions over the years from south Devon – one in very shallow water of about 2 ½ ft once. They’re a real treat actually as they certainly put a bend in the rod! It was late afternoon/early evening and with the tide now ebbing for an hour or so, it meant I could access a large group of rocks. This would allow me to cast a lure out into the vicinity of a large (25m ²) sandy patch interspersed with patches of flat rock on the seabed, into a depth of water approaching 15ft. I attached one of my favourite lures onto the lure clip – a Daiwa Shoreline Shiner 120F 3D (Vertice) in the Innako colour (see below). On about the 6th or 7th cast following only 3 or 4 turns of the reel handle and at a range of about 40 yards, I felt a very solid THUMP!… Not a bass like WALLOP!… The fish stayed well below the surface even though it must have risen a fair way up in the water column to hit the lure as the Shorline Shiner only swims down to about 2ft max. Normally a bass will thrash on the surface but the larger ones will sometimes stay deep so I wasn’t entirely sure what this was? With the fish swimming towards me more than anything else the Slash Lamya Thief was still getting a real workout, but I wasn’t really thinking ‘bass’ as the fish just wasn’t taking any line. Well… until it saw me that was! A very powerful dive put a worrying amount of strain on the 4 – 28g lure rod and my Mitchell Mag Pro Extreme was squealing for 3 – 4 seconds, and I was praying that whatever this was wasn’t going to pull the braid/leader across a sharp pinnacle of rock that I could just make out… With a bit of pressure exerted, I could feel the fish moving up in the water whereby it surfaced! Wow! I quickly nipped closer to the waters edge before the next (smallish) swell broke up onto the rocks and grabbed the fish… Bloody hell! this pollack was without doubt, my largest to date from the shore (I had one weighing 9lb out in the boat once) and measured just over 65cm. Following some research, this equates to around 6lb apparently. I recently acquired a Go-Pro Hero 3 specifically to film ‘catch and release’ footage, so I was pretty excited about getting this beast on camera. Therefore, following a couple of very quick shots with my regular camera on the 10 second timer, I placed my prize into a rock pool as I was very conscious of getting this specimen back safely; as pollack do not survive very well out of the water. Just as I switched the Go-Pro on, a larger swell washed into the pool and I watched in disbelief as the pollack made good its escape – I could maybe have intervened but nevermind… At least I got to catch it, take a picture and see it swim off strongly so I was happy. All in all, it’s been an interesting couple of days guiding and fishing with lots learnt. Next Bass on Lures for my Clients – Dusk does it! Interesting post and mirrors my own findings this spring. I’ve had wrasse on soft lures and pollack on metals. I also had a small pollack on a surface lure but my best pollack (3lb) was on a SG shallow diver. I’ve yet to see a bass, despite fishing some likely places in text book conditions. I’ve seen a few small sandeels but no concentrations or evidence of predators. I’ve found the wrasse hard to catch in or just after the rain, not sure whether the freshwater influx prompts them to move away from the shoreline or just puts them off feeding, perhaps it’s the sudden reduction in visibility as the water clouds up with the run off. Forecast for S Devon is rain all week, hope you prove me wrong. Great read mark. I’ve had shore pollock on metal spinners and soft plastics. Mainly eddystone eels from the shore but never yet on a hard plastic. And nothing quite like 6lb either. Probably 3lb maximum. Thanks Lee – It was a beast! !